If you're to believe advertisers and certain enduring tunes, the holidays are "the hap-happiest season of all." But that's not the case for everyone — and especially not for those missing someone special around the table. "The holiday season can be a challenging time for families who have lost a loved one," says Dianne Axen, bereavement coordinator for Mayo Clinic Hospice. To support these families, Mayo Clinic Hospice hosts a special holiday program each year. 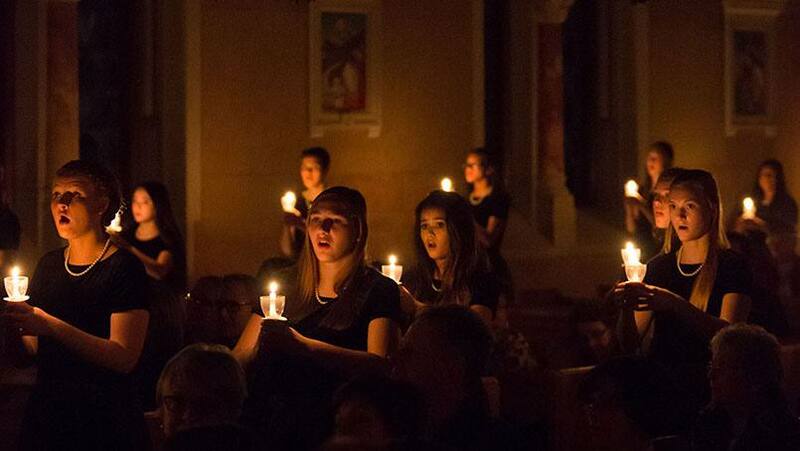 This year's event, which featured music from Bella Voce Young Women's Choir, offered "a healing and connecting gift" to families, Axen says. It also reminded them "that they are still a part of a community that knows and cares about their loss." For Shelly Winemiller, director and founder of Bella Voce, the concert was meaningful both professionally and personally. Her mother received hospice care prior to her death two years ago, and Winemiller says hospice staff helped the family focus on sharing memories and music together. "It was such a gift," she tells us, adding that "in this season of giving," she and the Bella Voce members were "honored to give this gift of music to those who are grieving." The concert, which took place in a candlelit chapel at Assisi Heights in Rochester, was indeed a gift, says Carolyn House, a retired Mayo Clinic nurse manager. Two years ago she lost her husband of 53 years. "You are never really prepared for the 'surges of grief' that inevitably come" after such a loss, she says, adding that "you rely on memories to get you through." For Carolyn, those memories include music. "Music was a big part of our life," she says, adding that she and her husband, Jerry, had attended Bella Voce concerts together. "Being here soothes me," she tells us. "Concerts like this stir the good memories." Winemiller calls music a "universal language" that "allows people to remember and to heal." Including, it seems, the young women singing, because in addition to offering hymns, the choir members also offered their own stories of loss throughout the concert. One remembered a grandfather's unexpected passing. Another spoke of seeing her own father cry for the very first time. Another told about caring for a critically ill sibling. Those stories helped to blur the lines between audience and performers, uniting them as one community. And that in itself has a healing power. "The journey of grief is a journey toward finding meaning," Axen tells us, and one that "is accomplished in relationships with shared experiences and shared stories." You can share an experience with us by sharing your comments below. Then, you can use the social media tools to share this story with others.